Born Edinburgh the son of an accountant he studied at the Trustees Academy under Scott Lauder. His earliest pictures were figure compositions but in the 1860’s he turned to landscapes. In 1866 he settled in London and achieved success at the Royal Academy with “The Spate” this led to a commission from Queen Victoria, “Bowmans Pass Balmoral Forrest”. 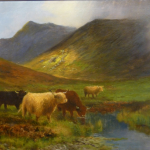 Although living in the South he returned to Scotland each year and painted many landscapes of the most rugged and inaccessible terrain. Such was his success his dealer Sir William Agnew held a waiting list for his work.